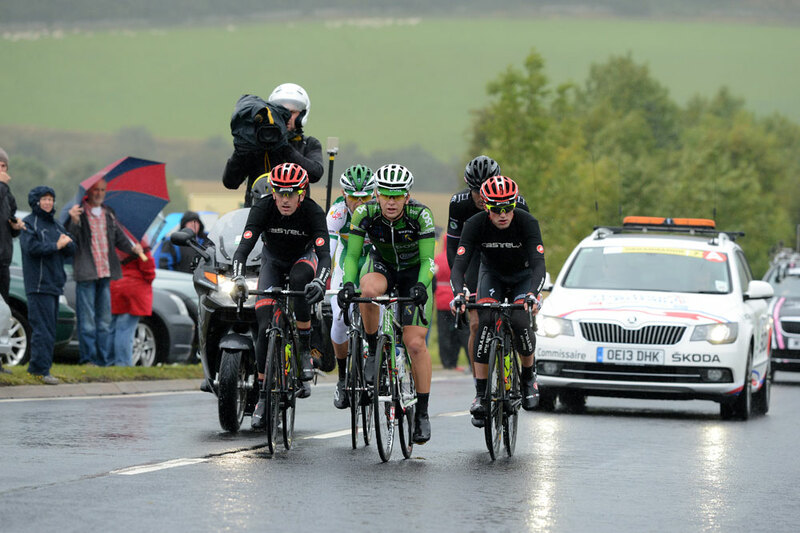 As predicted by many, the opening stage of the Tour of Britain ended in sprint in front of Drumlanrig castle near Dumfries. 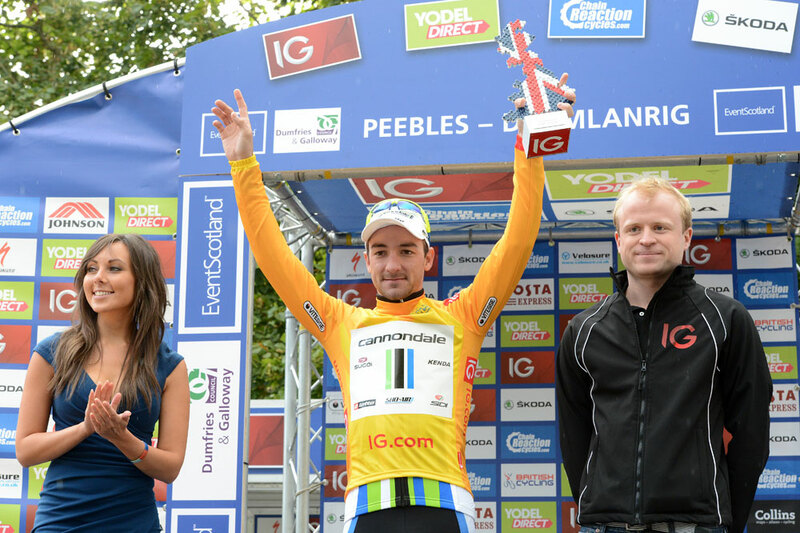 As predicted by almost nobody, the sprinter who crossed the line first was 24 year old Elia Viviani of Cannondale rather than Mark Cavendish of Omega Pharma. 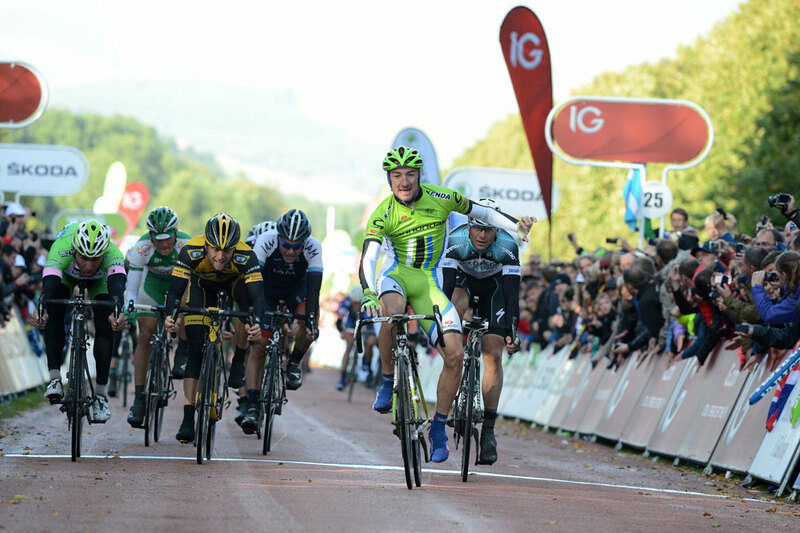 In fact, Cavendish’s new lead out man Alessandro Petacchi was second in the gallop, with Gerald Ciolek (MTN Qhubeka) and CSF Bardiani’s rapid Sacha Modolo. 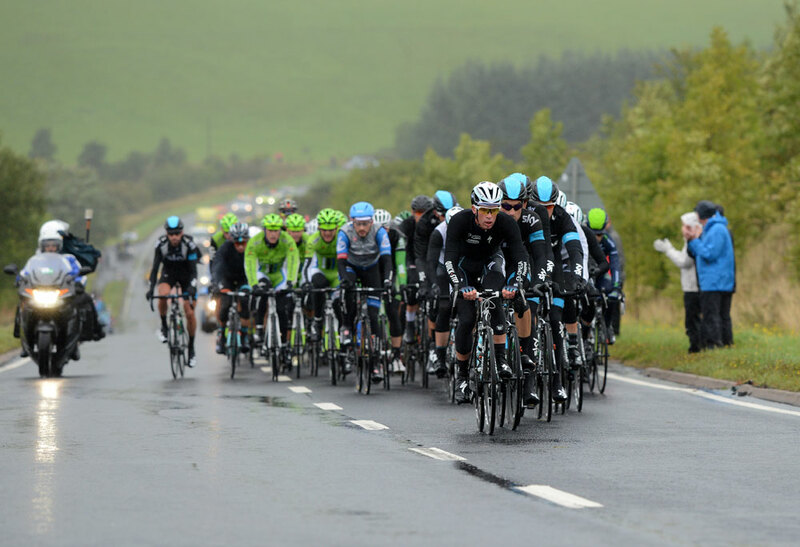 Cavendish, racing in his British road race champion’s jersey, was a spectator in the grippy, slightly uphill finish which ended a stage that tested waterproofs and nerves more than climbing legs. 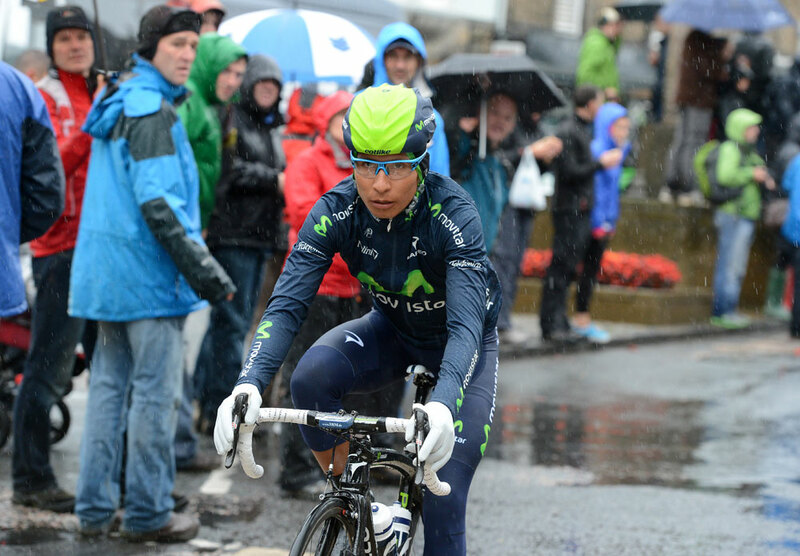 The 209km trek between Peebles in the Scottish borders south west to Drumlanrig started in miserably wet weather and, although the rain eased up, the wind stayed and the stage ended behind schedule. The five-man break of the day contained Irishman Peter Hawkins (IG Sigma Sport), Christophe Laborie (Sojasun), Ben Greenwood (IG Sigma Sport), Aaron Gate (AN Post Chain Reaction) and of course there was no way an early break in this race would go clear without Kristian House of Rapha Condor in it. They have just shy of a two minute lead, but at no point did it ever look like they were going to build the sort of lead that would see them stay clear. With 50km to go, as the break toiled up the Dunscore climb into a tree-bending headwind, Sojasun’s Anthony Delaplace jumped clear of the Sky-led bunch, bridged to the break and rode past them. He quickly gained over a minute (actually 1-28 with 27km to go), but it was more down to the fact that the firepower in the bunch was confident it could ride him down as and when required. Nevertheless, with Sojasun still looking for a sponsor and riders deserting the sinking Soya-based ship, maybe Delaplace was intent on showing the world he was still racing and still worth a new contract for 2014. 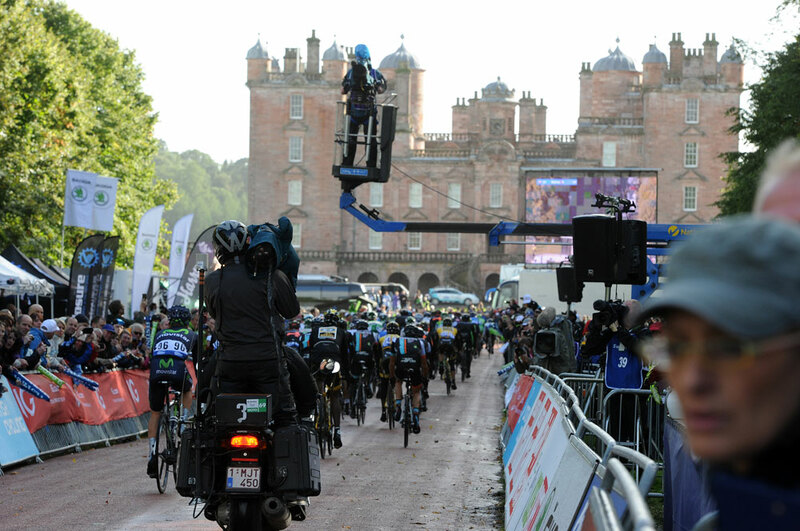 Sure enough, with Sky, Garmin and Omega Pharma sharing the pace and chasing, Delaplace was caught with 14km to go as the field got to the finishing lap around Drumlanrig, briefly blessed in sunshine. It was noteworthy that Bradley Wiggins nipped out of the bunch to take a bonus second (he was third over the finish line behind the just-about to be caught Delaplace), suggesting that he really does have more in mind that a time trial stage win and a ‘comfy’ ride around in the bunch. But Wiggins wasn’t going to win today, with the bunch together, Omega and Garmin tried to hold things together for their sprinters. Garmin had young Australian duo Steele Van Hoff and Nathan Haas, while Omega was clearly banking on Cavendish. The final kilometre was far from flat and, although Petacchi looked to be trying hard to do his best ‘pilot fish’ job for Cavendish, the British champion was boxed in and never made it to the front again, leaving Petacchi to claim third behind Viviani. It was not the start Cavendish wanted, but, if one British hero looked a little race rusty, another, Bradley Wiggins, looked up for it.